Vickster51Corner – Page 45 – Talking about all my favourite things – Theatre, TV, Film & Books! So another year filled with theatre has come to an end and it’s time to reflect on all the wonderful productions and moments I’ve enjoyed this year. After a personal record of 90 productions in 2012, last year returned to around my usual annual average, with a total of 53 separate live theatre productions, of which I returned to see six on more than one occasion giving a total of 72 theatre trips in 2013 (plus an additional five were seen via archive recording, NT Live Encore, RSC Live or Digital Theatre). It has been quite difficult to compile my ten favourite productions but after much thought and in no particular order (as ranking them further would be too big a challenge! ), my top ten is below. Seawall (NT Shed) – at only 30 minutes, this beautiful monologue written by Simon Stephens a few years ago was revived at the National Theatre’s temporary theatre The Shed. Andrew Scott’s performance was utterly incredible and moved me to tears, making this one of the finest productions I have ever seen on stage. Such a pity a woman’s phone rang with just one line left to go, although Andrew is to be commended for keeping his focus and delivering the line with such power despite this interruption. Seawall is available to download for £3.50 and I recommend you do so as soon as you can (go to http://www.seawallandrewscott.com ). Richard II (RSC – RST & Barbican) – Greg Doran’s time in charge at the RSC was off to a superb start with this brilliant production. Incredibly clear, wonderfully staged and finely acted by a strong ensemble, I loved this production and David’s interpretation of Richard’s unlikeable character, before generating true sympathy from me. Special mention to the superb Oliver Ford Davies as York and Oliver Rix, whose Aumerle is one of the stand out performances for me and whose scene at Flint Castle with David Tennant was played in a deeply moving way. If you can acquire a ticket before it finishes at the Barbican on 25th January I urge you to do so. Bull (Sheffield Crucible Studio) – My first trip to the Studio at the Crucible is another highlight for me. At a mere 50 minutes Bull is a powerful play, highlighting the bullying power struggles that take place in the workplace. 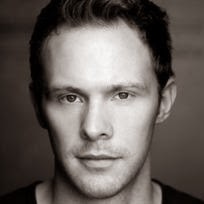 Adam James and Eleanor Matsuura brilliantly play two colleagues determined to be on top, whilst Sam Troughton’s portrayal of the team member caught in their sights was excellent. The tension builds throughout in the bull ring setting, until the explosive ending, which became almost too uncomfortable to watch. I hope this Mike Bartlett play (which also transferred to New York in 2013) gains a new lease of life soon. 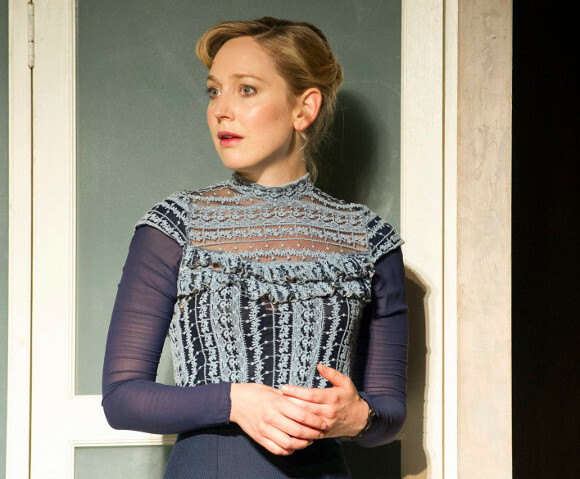 Untold Stories (Duchess) – A gem of a production, which I missed at the National Theatre, where it was staged as two separate pieces prior to performances of Alan Bennett’s People. I had no idea what to expect and was surprised by how wonderful and indeed moving the two pieces were. 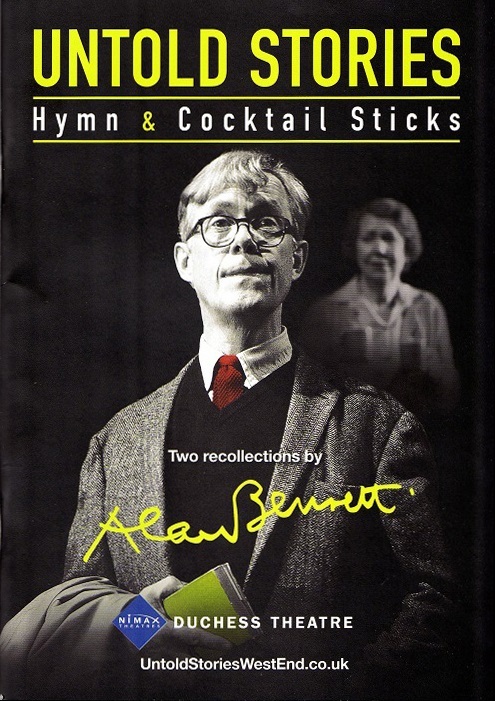 I especially enjoyed Cocktail Sticks, in which Alex Jennings (a superb Bennett) describes his childhood life, in both humorous and tender anecdotes. Macbeth (Manchester International Festival) – I found this production of Macbeth truly impressive. The setting of Shakespeare’s Scottish play in a deconsecrated church in central Manchester was an inspired decision, as the setting certainly added significantly to the evocative atmosphere of the play. Kenneth Branagh was very good as Macbeth, although it was Ray Fearon’s Macduff that really captured my attention, through his strong performance. I have never fully engaged with Macbeth until I saw this production and I think it will be a hard act to follow. No doubt it will be very popular when it transfers to New York. 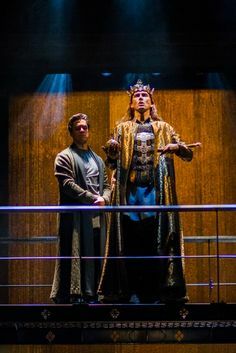 Edward II (NT, Olivier) – This production of Christopher Marlowe’s play didn’t appeal to everyone, but it certainly appealed to me (I saw it twice). I found the staging to be exciting and something daring to be different, mixing live action, with scenes only visible through footage from hand held cameras, not to mention a brilliant scene incorporating characters arriving at the theatre and proceeding to follow them on their route to the stage. As someone who thinks John Heffernen is a superb actor, it was wonderful to see him in the title role and I thought his portrayal of this unfortunate King who is ultimately deposed and his chemistry with Kyle Soller’s Gaveston was wonderful. I hope to see more productions taking such a daring approach in the future. 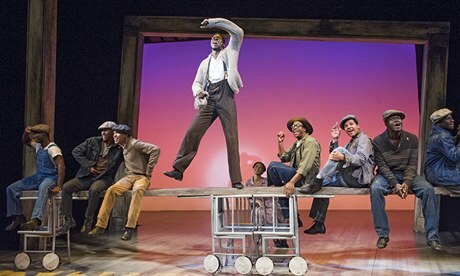 The Scottsboro Boys (Young Vic) – Of the musicals I have seen this year (which also included The Light Princess and the much-hyped Book of Mormon) the one that stood out for me was The Scottsboro Boys. I was not familiar with the tragic story it tells of the nine men wrongly accused of assault in Southern America. The structure of the musical, conveying such disturbing events in the form of a minstrel show was very effective is highlighting the cruel treatment of the men. It was also performed by a magnificent cast whose singing and dancing were impressive to witness. I couldn’t fail to be moved by the end of this story and it was certainly a production that stayed with me for longer than any other musical I saw last year. 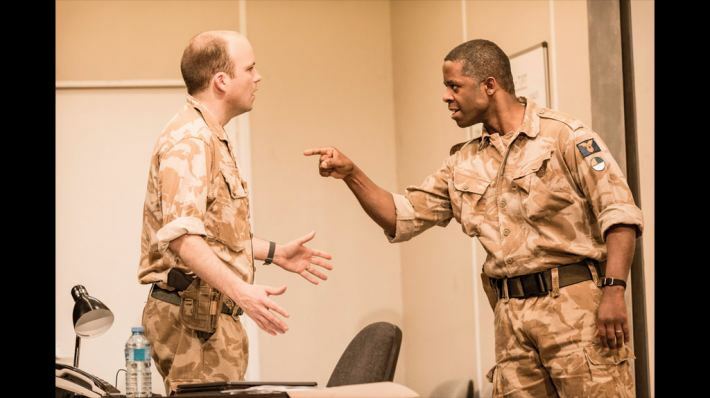 Othello (NT, Olivier) – After a couple of cancelled trips, I finally saw the National’s acclaimed production starring Rory Kinnear and Adrian Lester in the last few weeks of its run and it was just as wonderful as I’d hoped. The military setting was realised perfectly for me and the interplay between Lester’s Othello and Kinnear’s Iago was electric. I was particularly excited by Kinnear’s performance as this was a very different role to any other I have seen him do on stage. I also enjoyed Olivia Vinnall’s Desdemona and I look forward to seeing her again later this month in King Lear with Simon Russell Beale. 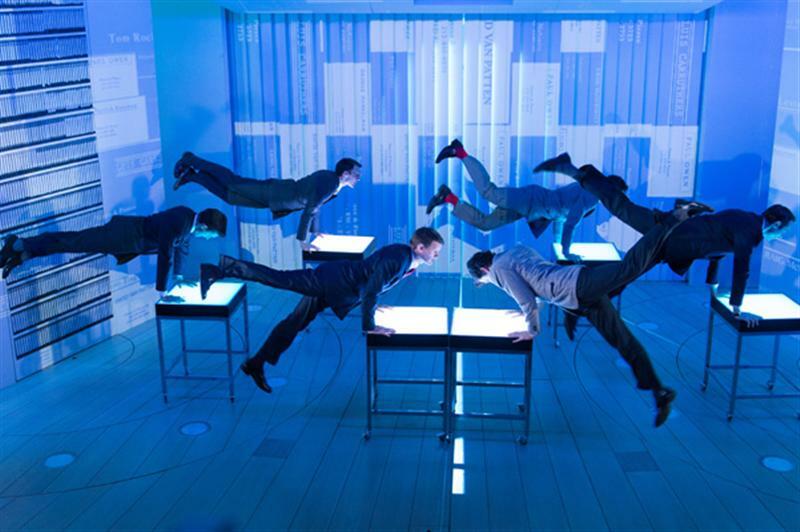 American Psycho (Almeida) – Not everyone’s cup of tea perhaps but I thoroughly enjoyed this production and it has only grown stronger since it began (I saw it again this weekend). Yes the vocal ability of some of the cast may not be perfect, but then this is not your typical big West End-style musical. I found it to be inventive, creative and I was excited to see something daring to be a little different. I had been sceptical of Matt Smith’s casting in the main role, but he is fantastic. He plays detached and emotionless superbly, giving his Patrick Bateman an underlying creepiness, but is also able to convincingly convey the emotional moments as well. It is also exciting to see he is growing in confidence in the role and when he is on stage I just couldn’t take my eyes from him. It is worth trying to get a ticket before it finishes on 1st February is you can. As it was so difficult to choose ten, these are the productions that could easily have been included. After The Dance (NT Archive) – after over three years since I saw it live at the National Theatre, it was wonderful to see this beautiful production again. I love everything about it (see my earlier blog post about it!) and it remains my favourite production to date. Private Lives (Duchess from Chichester) – This was second on my list of 2012 when I visited Chichester and its transfer to London was just as wonderful. Superb casting and staging made this a joy to see again. Curious Incident of the Dog in the Night Time (Apollo Theatre) – My favourite production from 2012 is just as wonderful in its West End home. A wonderful adaptation by Simon Stephens, astonishing staging and beautifully performed. I cannot recommend this enough if you have yet to see it. Frankenstein (Cumber Creature, NT Live Encore) – A Halloween trip to the cinema to relive the National’s 2011 Frankenstein with Benedict Cumberbatch and Johnny Lee Miller was very enjoyable, particularly with Cumberbatch playing the Creature (my preference for the alternate roles). The only time I saw this version on stage was the very first preview and it was lovely to see how the production had grown over the run prior to this recording. I had also forgotten just how incredible the first 20 minutes was when Cumberbatch’s Creature is learning how to take its first steps in life. The Pitman Painters (Sheffield Lyceum) – After missing this at the National, I adored it at the Duchess Theatre in 2012 and it was lovely to see it on tour again in 2013. So funny and also heartfelt. The Effect (NT, Cottesloe) – Had I not already seen it in 2012 this production would have been a contender for my top 10 this year. Billie Piper and Jonjo O’Neill’s performance, particularly at the end were wonderful. Thankfully there haven’t been many of these this year and in fact the only ones that deserve a mention here are Viva Forever (so bad it was funny) and Afraid of the Dark (in short no I wasn’t and I can’t imagine anyone else ever would be). – An incredible costume change in the Book of Mormon, carried out in a blink of an eye! – John Heffernen’s skill to consume half a fruit cake in The Hothouse! – A fascinating reading of Thomas of Woodstock by the Richard II ensemble. All in all it’s been a fantastic year, in which I’ve seen some wonderful moments on stage by some of the finest actors working today. I am thoroughly looking forward to what surprises 2014 will bring (and I’ll post my top 10 for 2014 shortly)! 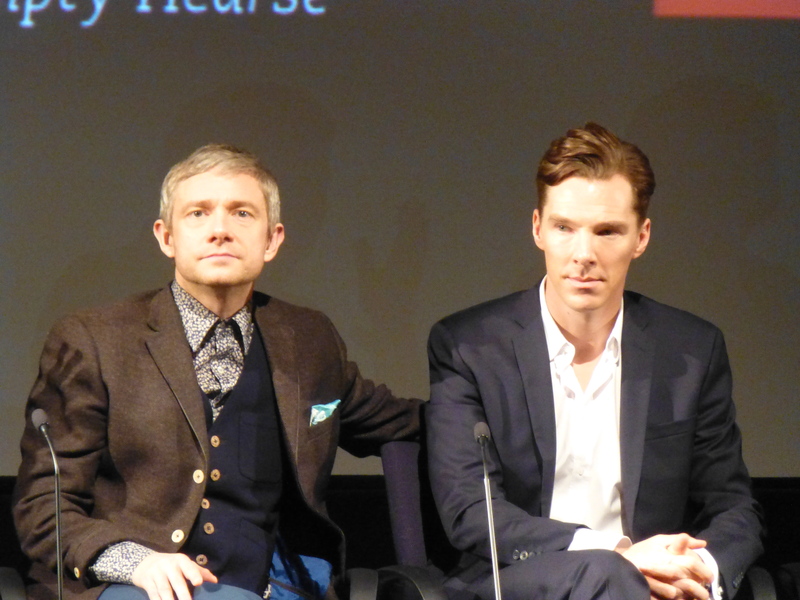 Sherlock: The Empty Hearse Preview – Spoiler Free Thoughts on a fab day! I’ll start by saying this contains no spoilers. 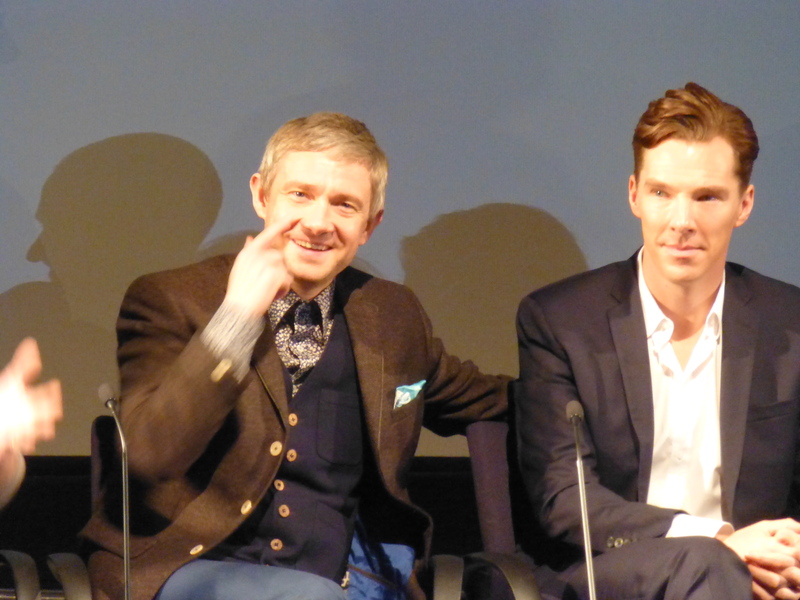 I am not planning to ruin the thrill and surprise for any fans of Sherlock but had to record my thoughts of such a fantastic day at the BFI Southbank. I’ve been to a few events at the BFI but this atmosphere was something else entirely. From the moment you arrived you could sense the excitement. The box office area was packed with people waiting for returns/standby seats and people hoping for a glimpse of the stars. In NFT1 itself, as everyone took their seats, the anticipation and excitement was contagious. I couldn’t quite believe I’d managed to get a ticket all those weeks ago and here we were. I have been lucky enough to see a lot of filming in London for series 3 and was also excited to see those bits on film too. My spolier-free review of the actual episode The Empty Hearse is quite straightforward – the episode is fantastic and one of the best pieces of TV ever made. It’s rocketed straight to the top of my favourite Sherlock episodes too (taking the crown from A Scandal in Belgravia). The episode feels very expensive in terms of production values as the quality is superb. Jeremy Lovering’s direction is excellent and he takes the stylish baton from Paul McGuigan and adds to it. Seeing this on a big screen was a privilege. The story itself is fantastic. There is just about everything in this 90 minutes – light-hearted fun, bonkers humour (some bits had me cracking up along with everyone else), action, tense thrilling scenes and wonderful emotional depths. This is all possible due to the strength of the ensemble of Sherlock. Everyone adds to the episode to strengthen it, particularly Louise Brealey, Una Stubbs and Rupert Graves. Amanda Abbington has a great start as Mary and will no doubt be a super addition to the team at 221b. They are of course all led by the supremely talented Benedict Cumberbatch & Martin Freeman, whose talents know no bounds as Sherlock and John. The have so much to do in this episode and do it brilliantly. Martin handles John’s range of emotions at seeing his friend again wonderfully and gives a very real, human performance. Benedict is, as usual, excellent in a role that no one could do better and together they are a joy to watch. It almost doesn’t feel as if it’s been 2 years (well…almost)! It will be interesting to watch again without the crowd there, as this group viewing experience certainly heightened the responses – so much cheering, clapping and laughing throughout. Steven Moffat and Mark Gatiss have created an incredibly special series with Sherlock but I have to give so much praise to Mark Gatiss for this episode. His writing is wonderful in The Empty Hearse – totally barmy one minute and deeply touching the next. The nods to not only Conan Doyle but to the show’s own incredible success is very well done and never feels too much. Plus he has written Mycroft some of his best bits here too, which is lovely. The Q&A was a disappointment and rather uncomfortable. Caitlin Moran’s choice of questions and approach were odd, especially from someone who is a fan and has done some great interviews in the past (her Benedict one is very good indeed). She brought people’s attention to fans in the back of a shot (which I didn’t notice but my friend did) which made me feel very sorry for the director and although it was made light of by the panel, it felt quite uncomfortable to watch. I will also never understand why she thought getting Martin & Benedict to read some slasher fanfiction was a good idea! Very awkward indeed. 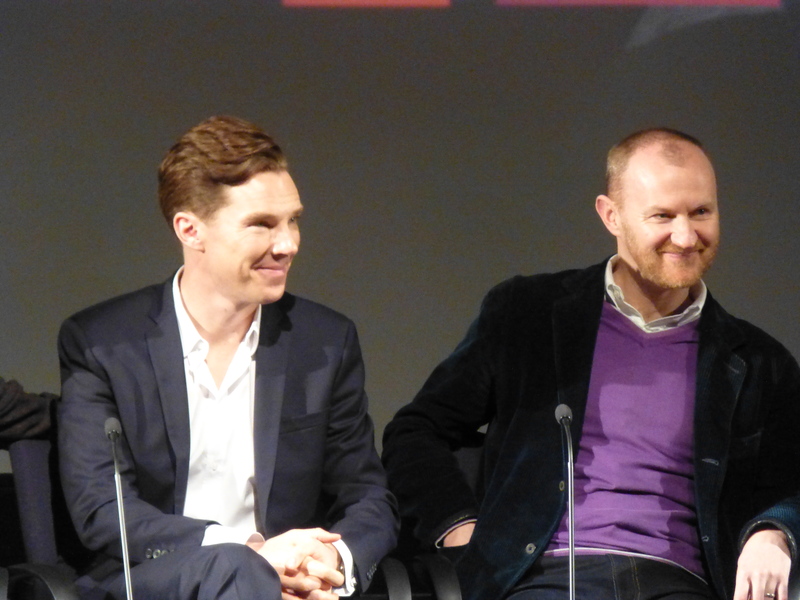 Not all awful though – Benedict & Martin were able to acknowledge how respectful fans are at filming. Mark Gatiss remembered screams from the crowd at one point and on being asked what had happened, responding Martin had just opened a packet of crisps! Some better audience questions (favourite scenes to film, how some of the story was thought of, how Mark finds writing and acting his own scripts (jokingly he said he finds it easier to remember the lines when it’s his scripts)). It was also lovely to see so many of the cast past and present in attendance, highlighting how much of a family the programme is for those who create it – as well as the panel (Benedict, Martin, Mark, Steven, Sue and Jeremy) in the audience was Louise Brealey, Una Stubbs and Andrew Scott as well as the composer and some of the production team. I hope no one spoils the twists and turns for others. I knew certain things from watching filming but still would never have imagined some of the magical moments and it really will be better as a surprise. I look forward to chatting on twitter once it airs on New Year’s Day! Rest assured though Sherlock is back a bigger and better than ever! Welcome back Sherlock – it really has been far too long but that episode was so good it was worth the wait! 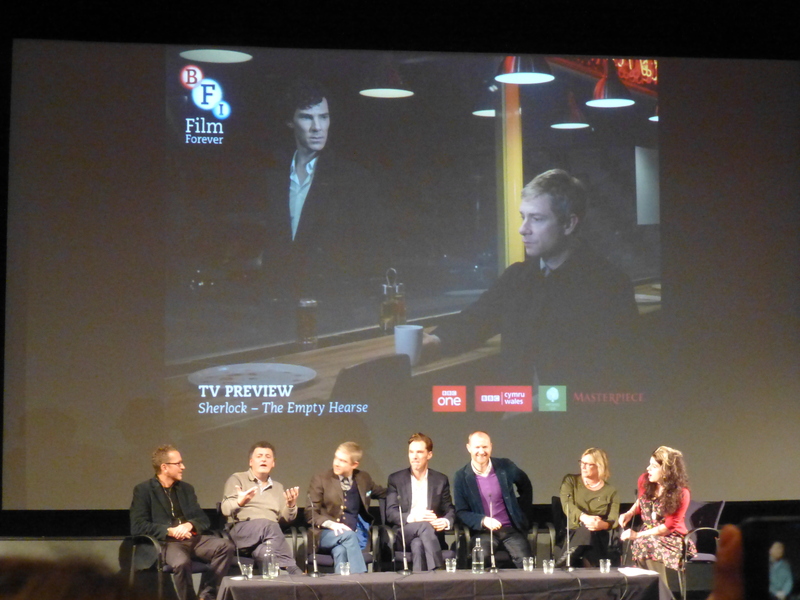 Posted on December 15, 2013 December 15, 2013 Categories SherlockTags BBC, Benedict Cumberbatch, BFI, Mark Gatiss, Martin Freeman, Sherlock, Sherlock Preview, Steven Moffat, The Empty Hearse1 Comment on Sherlock: The Empty Hearse Preview – Spoiler Free Thoughts on a fab day! Oliver Rix – King for an afternoon! Part of the ethos of the Royal Shakespeare Company is that it is an ensemble company; everyone works together for the good of the production as a whole and nothing displays this more clearly than the role of the understudy at the RSC. Almost everyone in the company of any production is expected to understudy another role, which I can only imagine must be a huge amount of additional commitment. However this effort is rewarded by the staging of the public understudy performance – for one show only, the public gets to see an alternative performance – the same staging, costumes, music and actors, but everyone is playing their understudy role (or roles in some cases!). The RSC’s support of the understudy run is to be commended. It is only right that the efforts of the actors to learn other roles for the benefit of the ensemble as a whole are celebrated and the fact that this is done so publicly is another reason I admire and support the RSC. 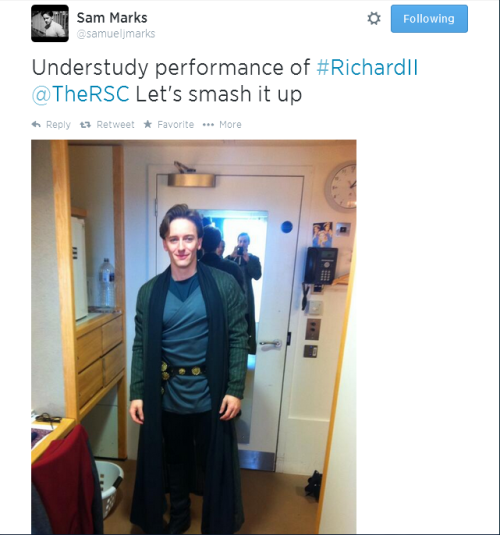 On Tuesday afternoon it was the turn of the company of Richard II to take to the stage to perform the understudy performance to an almost packed RST. I have only ever been to one previous understudy run (for 2010’s King Lear) and I was very excited to see the production done a little differently, particularly once I knew the superb Oliver Rix was playing Richard (more on that later). It was also lovely to see the remaining cast, who were not taking part, settling in to their seats to support their fellow actors. Oliver Ford Davies and Jane Lapotaire were seated behind me, with Michael Pennington across the aisle. I also spotted David Tennant, who must have sneaked in after the lights went down (although he must have changed seats for the second half). As for the performance itself, it was simply superb. Edmund Wiseman told us afterwards that they had had only 12 hours of rehearsal time to pull the 3 hour show together and everyone involved should be very proud indeed. There were a couple of very minor stumbles over words, but other than that it was spot on and the overall result was a performance brimming with an energy all its own that you couldn’t help but be excited about. Oliver Rix in his usual role as Aumerle. He was a superb King Richard. This performance was the younger, feistier sibling of the main production, in large part due to the predominantly younger cast. The ages of most characters therefore felt much less, setting this as a youthful Court of a young, cocky King Richard and it was very interesting to see different choices made for characters and a change of emphasis on certain lines. 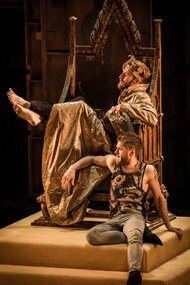 This highlighted one of my favourite aspects of Shakespeare on stage – each production and each actor can bring something new to the play and make you think about the text in new and exciting ways and there were certainly moments yesterday afternoon that did so for me, which I’ve tried to highlight in this review. I would say this is rather longer than my other reviews, but since this was a one off performance that I know not many people were able to see, I wanted to try and include as much as I could. First of all, I have to say that Oliver Rix (thankfully without any form of wig!) was absolutely superb as King Richard. I had been unable to see him in the 2011 season at the RSC and as his interpretation of Aumerle had already stood out for me in the main production, I was very excited to see how he would tackle the title role. I was not disappointed. Oliver’s Richard was a youthful, cocky King. He begins as a young man, who is almost playing at being a monarch and who arrogantly thinks he can do anything he pleases in a Court populated with youthful supporters who bend to his every whim. However Oliver’s immense skill as an actor meant that his Richard soon became a scared little boy, for whom I did have sympathy. There were a number of wonderful moments in his portrayal that were very different from David Tennant’s and were exciting to see. This wasn’t an imitation of someone else – this was Oliver’s Richard and I for one liked it very much indeed! Edmund Wiseman played Bolingbroke incredibly well. 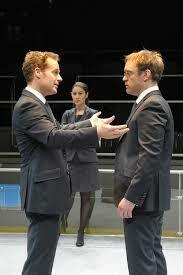 From the beginning of the play, the complicity of Richard in Mowbray’s actions felt very real and apparent. The gestures and interplay between Oliver Rix and Jake Mann were very effective in conveying two men very much complicit in the murder of Gloucester. There was also a very clever pause by Oliver Rix in Act 1 Scene 1, on the lines “Were he my brother, nay, our kingdom’s heir, / as he is but my father’s brother’s son.” David Tennant delivers this in a dismissive way about Bolingbroke – he is only his father’s brother’s son. Whether deliberate or not, Oliver paused at a different moment, instead pausing after “as he is” which worked brilliantly in acting as a portent of the events to come, when Bolingbroke does indeed become his heir. However, this cocky self-assured King was swiftly replaced by the frightened young man who finds himself with few friends on his arrival back from Ireland. His anger towards Bushy, Bagot & Greene’s supposed treachery was delivered full force, to be replaced with horror on discovering their ultimate fate and his delivery of the beautiful speech about the death of Kings was stunning in its emotional impact. The word sorrow during “Write sorrow on the bosom of the earth” was spoken as if the word itself was a breath, blown out across the sea. His reflective tone during the rest of the speech was wonderful, before Oliver reduced Richard to a small frightened boy, sobbing at how he has been mistook and himself needs friends, before collapsing on his side, weeping in sorrow, to be comforted by Joshua Richards’s Carlisle. I was surprised at just how moving I found the scene to be and it highlighted again what an emerging talent Oliver Rix is. The other key scene for Richard has to be the deposition scene and I thought the cast conveyed the variety of emotions brilliantly. Oliver chose to address more lines to the audience during the scene, turning to us when musing over how the men of the Court had once praised him, choosing to turn to the others on stage to deliver “Found truth in all but one; I, in twelve thousand, none” – fixing his stare pointedly at Aumerle on the word none. This King was also much angrier here, especially towards his Uncle York, whose tears visibly anger him (when compared to David Tennant, who chooses to convey Richard’s feelings here in a more subtle way). The biggest difference here though is how Oliver’s King chooses to play the moment he challenges his cousin to seize the crown. I love the way David Tennant does this in the main production, treating Bolingbroke as if he is a dog playing a game of fetch, and I thought Oliver’s choice, although different was just as powerful. Instead of holding the crown out for his cousin, he raised it in the air and placed it upon his head with his back to Bolingbroke before challenging him to seize it. Edmund Wiseman then proceeded to move to take it from off his head, only for the King to move his head away defiantly at the last moment. The effect was fantastic. 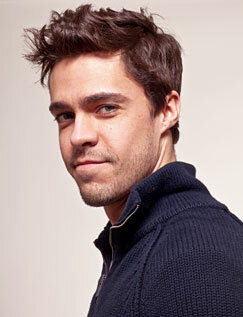 Edmund Wiseman was excellent as Bolingbroke and commanded the stage convincingly in his scenes. Stepping up from his usual role as Harry Percy, he has clearly learnt from the superb Nigel Lindsay and delivered an incredibly strong, powerful Bolingbroke, which was very much needed to stand toe to toe with Oliver’s strong King. Unlike Tennant & Lindsay, who are physically already very different, Edmund and Oliver played the relationship between the two more on an equal footing and had a fantastic chemistry. It would indeed be interesting to see Edmund set against Tennant’s Richard. One moment I particularly liked was the first scene, where Edmund and Jake Mann as Mowbray chose to stand nose to nose at one point whilst accusing each other, which worked well with younger actors in the roles. Keith Osborn’s York was very different from Oliver Ford Davies’ interpretation. His Duke is less of a doddering man, carrying more of a sense of control and authority. Indeed it seems almost reasonable that Richard would leave his kingdom in his Uncle’s hands. This also, in my opinion, made him far less likeable, as his betrayal of the King seems much worse than when you see the conflicted weaker York as played by Oliver Ford Davies. I very much liked his reaction to Aumerle’s treason and you genuinely believed that this was a father whom he should fear. Gracy Goldman did a great job covering three roles – the Duchess of Gloucester, Bagot and the Duchess of York. I found her Gloucester to be much more understated in her grief. She was restrained but just as powerful. Her Duchess of York was also good, although it would be very difficult to beat the brilliant comic double act of Oliver Ford Davies and Marty Cruickshank (who appeared as the Queen’s lady in waiting). Miranda Nolan played the Queen well, although perhaps not with as much emotional depth as Emma Hamilton (understandable with only 12 hours rehearsal!) . I did however really like her scenes and interaction with Oliver’s Richard and it certainly felt to me that they had a more genuine connection than between Tennant’s King and his Queen (although I think the fact Tennant is a far more feminine Richard may explain part of this for me). I also thought Elliot Barnes-Worrell (in his debut season for the RSC) was fantastic as Bushy and Harry Percy. I very much enjoyed his playful portrayal of Bushy and thought his interplay with Emma Hamilton’s Greene worked very well. It was also lovely to see more of Antony Byrne, who disappears all too quickly as Mowbray in the main run, and who on Tuesday became Salisbury and the gardener. Sam Marks was a very good Aumerle, although, without the rehearsal time to enhance it, I didn’t think his relationship with Oliver Rix’s Richard was as strong as it could be given time. I felt privileged to be able to see this one off performance. To be able to produce such a brilliant performance with only 12 hours rehearsal is a testament to the actors and the assistant director (who has responsibility for the understudy run) and Owen Horsley received a well-deserved round of applause at the end after being brought on to the stage by Greg Doran. The afternoon very much highlighted the importance of the role of understudy at the RSC as well as confirming further that there are clearly some stars of the future continuing to grow and learn there, none more so than both Edmund Wiseman and the superb Oliver Rix. I would have gladly paid full price to see it and would happily have returned to see it again if it were possible. I would definitely recommend a trip to one the RSC understudy performances in the future, especially if you have already seen the main run. It is a brilliant way to see another interpretation of the play and witness talented actors grow, and for only £5 (or £2.50 for members/supporters) it really is a bargain. It was well worth the trip from London for me and no one should worry – if David Tennant or any of the principal cast need a night off, the production will be in very safe hands! 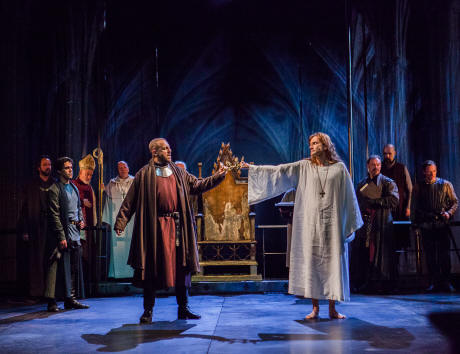 Review – Richard II (19th October 2013) Post press night thoughts! My last post about the RSC’s new production of Richard II set out my initial thoughts after the first two previews and last Saturday (19th October) saw my first trip to see the production after its press night. Initially the production, although strong and full of promise, had not wowed me and I expected the ensemble to grow in confidence in the lead up to press night. Such growth and development has certainly occurred and the production as a whole is significantly stronger now than it was which is fantastic. Everyone has grown in their roles and pivotal moments have been developed to great effect. The change made after the first preview to the overhead walkway remains (see my previous post) and the scenes set on it work far better without those central railings. From my Circle seat it was hard to tell whether the actors are attached to anything for safety but my friend has reliably informed me that David is indeed clipped on and in his scene with Aumerle puts his cloak over the railing in a way that disguises the wire. Subtle moments have been enhanced, in particular the fact that Richard has been involved in the murder of his uncle the Duke of Gloucester at the start of the play. This did not seem obvious during previews and I imagine may have been missed if you aren’t familiar with the play but it seemed clearer on Saturday, both in words and action. The moment I noticed between Richard and Mowbray has been enhanced. Richard not only captures him in an intense steely gaze, but their movements add to the tension of the moment – they don’t quite circle each other, but the effect is the same and the message is clear to the audience – Richard is implicated and Mowbray could say so at this point. Oliver Ford Davies, whose performance I thought was already superb, is now even stronger, which is a testament to how fine an actor he is and I think he is the stand out performance for me. He conveys York’s confusion and unhappiness at being torn between duty to his sovereign (whose actions he cannot support) and to his other nephew Bolingbroke who, as he laments to the Queen, has indeed been wronged by Richard. The comic scenes with his wife have also been heightened and together they brilliantly convey a husband and wife who clearly care about one another, but who are quickly divided by their contrasting actions towards their son Aumerle. Oliver Rix continues to grow in strength as Aumerle and his relationship with Richard is one of my favourite aspects of this production. I think perhaps my favourite scene is on the battlements on Flint Castle, which is beautifully played by both actors. I am also very excited to see Oliver’s own interpretation of Richard at the public understudy performance next Tuesday. Michael Pennington remains superb as Gaunt and his early scene with Jane Lapotaire’s Duchess of Gloucester is much improved, as I felt her performance was a little too exaggerated during early previews and is now far more believable. Nigel Lindsay remains excellent as Bolingbroke and his performance carries an air of confidence and authority that are perfect for the future King. Although a small part, Emma Hamilton’s portrayal of the Queen is also stronger and she adds a depth to the role that I haven’t seen before. Her emotional connection to her husband is also much improved. David Tennant has significantly upped his game in my opinion. Watching Saturday’s performance, it seemed as though he had more scenes on stage because he commanded my attention much more. His performance as Richard is now far more nuanced and he is clearly continuing to develop this difficult character. I love how bored he seems during the duel scene between Bolingbroke and Mowbray, slouching on his throne at one point, staring off to the side in a world of his own. His moments of anger are also much stronger, both in the initial scene when Bolingbroke and Mowbray will not be dissuaded from their challenge and also his aggression towards Gaunt. The softer quieter moments are also played superbly particularly his return from Ireland and the deposition scene is fantastically played. I noticed a slight change in that Richard did not jump up on to the throne in a defiant manner to demand his last request from Bolingbroke. Instead, on Saturday he simply sat down on the throne and delivered the line “Give me leave to go.” It was not defiant, just sad and he looked physically smaller on the throne and this staging added to my sympathy for Richard at that moment. In my opinion, this deposition scene is one of David’s best as he is able to display his full range – from sarcasm to sorrow to rage (“No lord of thine, thou haught insulting man” is delivered with such powerful hatred now) to humour. I also noticed the clever symmetry that it is Bagot who holds up the mirror for him, linking back to him doing so in the first half of the play when Richard is still King and the look Tennant gives him at this moment, suggesting the irony is not lost on him either, was an effective touch, sending Bagot scuttling away to the shadows. The staging is still fantastic and the visual backdrops were even more impressive from the Circle’s viewpoint, which also gives a fantastic vantage point for Richard’s prison cell. I also failed to mention in my initial thoughts, the first class efforts of the musicians and singers. They do a fantastic job, adding to the atmosphere and I especially love the combination of the drums and the chanting that transition us from Richard’s prison cell to the new King descending on his throne. I’m thrilled that the production has come so far in so short a time and no doubt by the end of the run in Stratford-Upon-Avon it will be even stronger. It was never going to wow me in the same way that Hamlet did, mainly due to my preference for the latter as a play. This is however a brilliant, clearly staged production of a Histories play that is less often performed and with such a high quality ensemble I hope it is able to open Shakespeare up to people who may not normally be interested (in much the same way Hamlet did five years ago). My next trip to the RSC is for the public understudy performance next week and I am intrigued to see the difference. For anyone still hoping to go and without a ticket, it’s worth keeping an eye on the RSC’s website for any returned tickets being put up for resale. Also, the returns queue on the day is another worthwhile option. Posted on October 23, 2013 May 21, 2016 Categories TheatreTags David Tennant, Gregory Doran, King And Country, Michael Pennington, Nigel Lindsay, Oliver Ford Davies, Oliver Rix, Olly Rix, Richard II, Royal Shakespeare Company, Theatre1 Comment on Review – Richard II (19th October 2013) Post press night thoughts! The Fifth Estate focuses on the early years of the website WikiLeaks up until its global impact after the leaking of thousands of US Government documents in the summer of 2010. WikiLeaks went from being relatively unknown to a worldwide news story. The film is based on the personal accounts of Daniel Domscheit-Berg and British journalists David Leigh and Luke Harding and therefore focuses on the relationship between Berg and Julian Assange in the early years from 2007 and how their friendship eventually broke down. I found this film to be quite slow, particularly to start with and I imagine many people seeing the film will complain that it is a lot of talk but I expected this. It isn’t an action thriller; it’s an intelligent dialogue-heavy film and therefore won’t appeal to everyone. I do however think that director Bill Condon builds the tension in certain moments well, for example, as we watch a character hoping to cross the Syrian border. Ultimately though The Fifth Estate is all about the central performances and I admit my main interest in going to see the film was to see Benedict Cumberbatch as Assange. The central performances by Cumberbatch and Daniel Brühl as Berg are very good indeed and raise the quality of the film substantially. Brühl is great at portraying Berg as a man caught between his ethical beliefs and his friend’s vision and belief in the transparency of all information no matter the cost. Cumberbatch is excellent as Assange, highlighting yet again his incredible range and versatility as an actor. There seems to be no role (on stage or screen) that he cannot do and his performance here is an extremely nuanced, effective portrayal of a man recognised worldwide but who still remains somewhat an enigma. His accent is very good in my opinion, but also each gesture and expression is thought through to transform him into Assange. In fact those who know him say it’s uncanny. It would have been interesting to have a better understanding of Assange’s early life, which is only hinted at in this film, but the audience has to remember that as the film is based on Berg’s experience with him, such aspects could never fully be explored. I was also disappointed by how little we see some of the other characters, in particular Peter Capaldi and Dan Stephens at The Guardian. Both are great actors but don’t have much to do here. Overall I enjoyed the film – it is an interesting insight into the central relationship behind one of the biggest news stories of the last decade and will be appreciated most by those who enjoy films such as The Social Network. I would probably describe it as an average film, which contains an excellent central performance by Benedict Cumberbatch, together with some notable supporting roles. 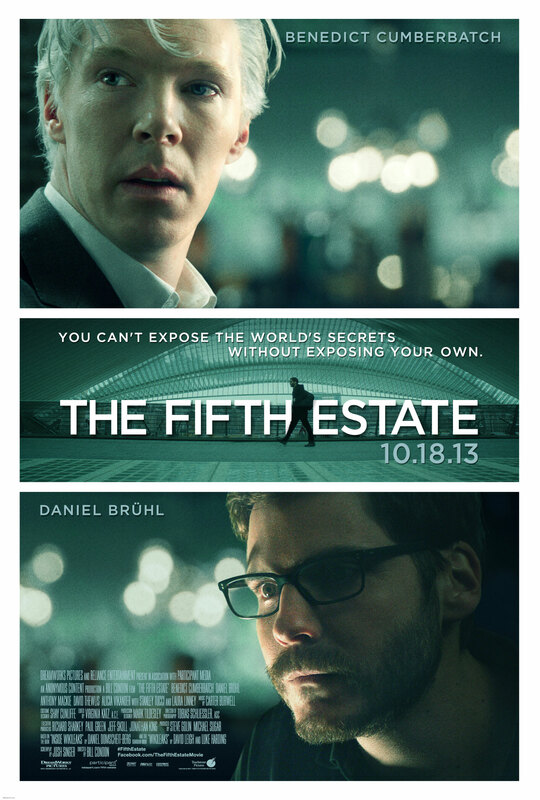 The Fifth Estate is out in cinemas now. Of all the films included at this year’s London Film Festival there was one in particular I wanted to see and that was 12 Years A Slave – the cast, director and the impressive critical praise it received in Toronto had me setting my hopes extremely high for this film and I admit that I was worried I may be disappointed. I couldn’t have been more wrong – every superlative expressed in relation to 12 Years A Slave is deserved, as it is nothing short of sensational. However it is by no means easy to watch and it will stay with you for days due to its emotional intensity. 12 Years A Slave is based on the diary account of Solomon Northup, a free black musician in 19th century New York, who in 1841 was kidnapped and sold in to slavery. On the promise of lucrative work as a fiddler he travels with two men to Washington. There they eat, drink, celebrate and on feeling sick he is put to bed to rest – only to awaken in chains in a dark basement with no proof of who is. For the next 12 years he is Platt, a runaway slave from Georgia, who is passed from one master to the next, whilst desperately trying to stay alive long enough to find a way back to his wife and children. This is an intensely powerful film from start to finish as we follow Solomon’s experience of life as a slave and director Steve McQueen (director of Hunger and Shame) presents a harrowing, honest, emotional exposure of slavery that has never been conveyed in such a way before. For a 21st century audience, seeing with how little regard human beings were treated in the not too distant past is frightening and truly heartbreaking, for example the cruel separation of a woman from her children for her to be told she’d soon forget them and the horrifying beatings and violence carried out by slave owners. Through Solomon’s eyes we see a broad spectrum of slave ownership – his first master John Ford (wonderfully played by Benedict Cumberbatch) seems almost a reluctant owner. He needs slaves to work his plantation but he seems to do what he can to treat them honourably and he develops a respect for Solomon’s ideas for the land, much to the anger and jealousy of Paul Dano’s architect Tibeats and also gives him a violin on knowing of his talents. However, Solomon does not remain with Ford. His challenge to the authority of Tibeats results in an attempted lynching, which in one of the toughest scenes in the film has Solomon hanging from a branch, desperately trying to keep his feet on the floor whilst everyday plantation life carries on around him. McQueen’s brave decision to linger on this scene for so long, with little (or no) music delivers the scene like a punch to the chest. 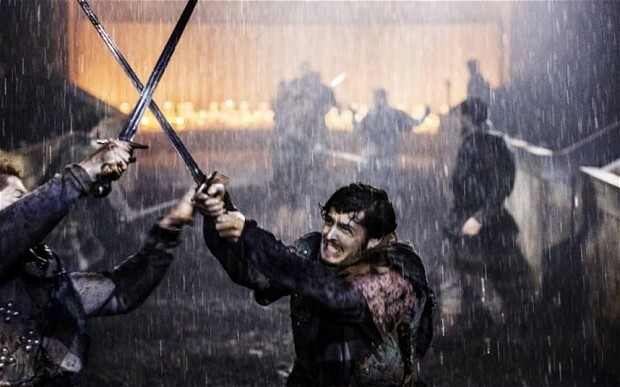 It is Ford’s need to protect Solomon from further harm that results in him being passed on to Edwin Epps (the terrific Michael Fassbender). Epps is very different to Ford. Clearly a sadist, he enjoys punishing the slaves who work picking cotton on his plantation, never seen more clearly than in the most harrowing scene in the film, when a slave is whipped almost to death. What makes this scene all the more unbearable is that Epps forces Solomon to give the lashes until, dissatisfied with his efforts, he finishes the ordeal himself. The camera does not shy away from the realities of slavery here. We see every lash, hear it and witness the awful wounds caused. I had to look away several times as did most of the people around me. Steve McQueen spoke after the screening of how such a significant part of world history has not been fully explored and that to him it was obvious that such a film should be made. He referred to the death of Trayvon Martin in Florida, the existence of a black President in America and the anniversaries relating to the abolition of slavery (2015 will see the 150th anniversary of its abolition), saying that it was the ideal time for such a story to be told. He also spoke of the fact that it was his wife who found Solomon’s published diary on which the film is based. Hans Zimmer’s score is very good too, balancing delicate moments with harsher ones and contains a strong use of metallic chain-like noises which links perfectly with the tone of the film and is quite unique. It is however the extraordinary cast that bring Solomon’s story to vivid life before our eyes. The contrast between his slave owners is perfectly acted by Benedict Cumberbatch and Michael Fassbender. Cumberbatch’s all too brief appearance is of the quality and standard we expect of this superb actor and it is a dramatic contrast to the character of Fassbender’s sadistic Epps. He plays Epps superbly, with a lurking malevolence, which makes him truly frightening – we know the violence he is capable of and that it could be unleashed on a whim at any moment. Epps’s wife (played by Sarah Paulson) is another shocking character – her clear hatred of one of the slave girls (newcomer Lupita Nyong’o) to whom her husband has taken an unfortunate liking is appalling and led to gasps from the audience at one particular moment. Lupita herself is astonishing in her role, conveying the pain and anguish that her character Patsy feels. At one moment she begs Solomon to kill her to end her suffering and you cannot feel anything but sadness that this was the life people had to endure. Brad Pitt is also very good in his small but pivotal role, as a man against the inequality and cruelty of slavery and unafraid to say so to Epps and to do what is right. However it is Chiwetel Ejiofor who is the centre of this film and his performance as Solomon is quite simply breathtaking and one of the finest performances you will ever see on screen. Through him we feel every beating and see just how strong the human spirit can be in the face of such terrible injustice and cruelty. I do not think I have ever felt as emotionally invested in a character in a film as his beautiful realisation of Solomon and I defy you not to be moved to tears by the final scenes of this story. 12 Years A Slave is certainly not an easy film to watch and is an intense exploration of, in Solomon’s words, “man’s inhumanity to man”. However it is a film and a period in history that very much needs to be given greater attention so that we never forget (in the same way as Schindler’s List makes us never forget the atrocities of war). Every element of this film is stunning – the script by John Ridley, the performances, direction and score and it reminded me how incredible a film can be. The screening received a standing ovation, something I’ve never experienced in a cinema, but which felt wholly appropriate for a film that delivers as strong an emotional punch as I’ve ever felt at the theatre and standing to applaud seemed absolutely right. It is the power and message of Solomon’s story that are important rather than any award, but in my opinion, no other films need be submitted for next year’s awards season. I have seen my Best Picture, Director and Actor (not to mention a number of incredible supporting roles) and I’m certain that anyone who sees the film will agree and I could not recommend it strongly enough. 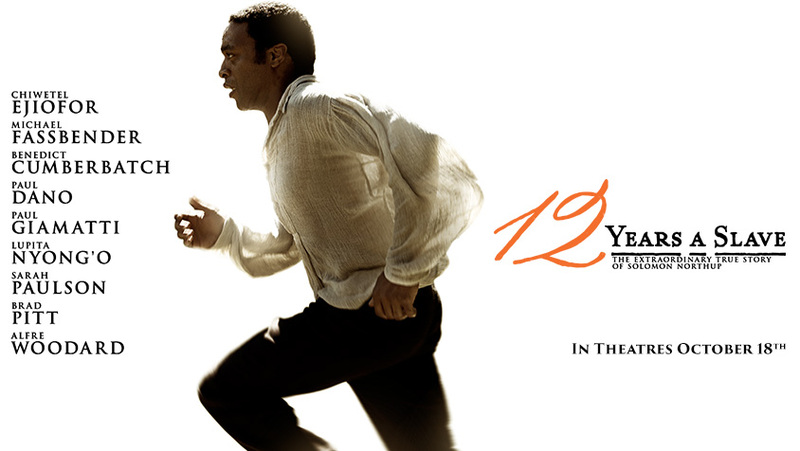 12 Years A Slave is now on limited release in America but will not be released in the UK until January next year. I do however urge you to go and see it as soon as you are able and in the meantime the original diary of Solomon Northup can be purchased for as little as 77p (I’m reading it on my Kindle at the moment). Last night I attended the UK premiere of Parkland at the London Film Festival. Written and directed by Peter Landesman and based on the writing of Vincent Bugliosi (in his 2007 book Reclaiming History: The Assassination of President John F Kennedy and, in particular, the chapters of that book that became the later release Four Days In November), the film tells the story of one of the most momentous days in history – 22nd November 1963 and the assassination from the perspectives of ordinary individuals who found themselves caught up in unimaginable events. The film takes its title from Parkland Memorial Hospital, the hospital to which both the President and Lee Harvey Oswald were taken and pronounced dead within hours of each other. Its style chooses to shine a light on a number of different character strands that are interwoven throughout the film and one key strand is indeed that which takes place at the hospital, where the same doctors and nurses attempted to save both men. Other strands focus on Abraham Zapruder, whose 8mm camera film would become one of the most scrutinised pieces of footage ever captured, as the only film to record the murder from beginning to end, the head of the Dallas secret service Forrest Sorrels, the FBI agent James Hosty, the secret service team and the family of Lee Harvey Oswald, in particular his older brother Robert. Novelist and first time director Peter Landesman’s style for the film reflects his past as a journalist, as the film has a documentary style, with unsteady camera movements and the intercutting of actual footage from 1963, which gives the audience the perspective of someone present in the moment. The director indeed said in the Q&A after the screening that that was one of his reasons for working with cinematographer Barry Ackroyd (who also worked on Captain Phillips), in order to give the film a feel of almost being in a war zone environment. It was also important to him and the producing team (Tom Hanks & Gary Goetzman) that the film was made only if it was factual – that everything included could be verified and confirmed. Therefore this is not a film that delves in any way in to the many conspiracy debates that still surround the assassination or adds artistic licence in the way Oliver Stone did with his film JFK. Instead it focuses on the smaller real life moments that are often overlooked when discussing these tragic events, for example, the lead nurse in the ER making sure Lee Harvey Oswald does not live or die in the same room that the President had been in just hours before or the practicalities of how to get the coffin on to Air Force One so that the President was not stored as if a piece of luggage. I did find the film to be quite powerful, possibly due to the fact that it isn’t a glorified Hollywood movie and instead feels far more realistic, and it does contain some very moving moments. Paul Giamatti is (as usual) superb in the film, portraying a man whose name I knew but knew nothing more about. His portrayal of Abraham Zapruder is of a man who is utterly devastated by what he has witnessed and indeed is horrified that he has captured such a terrible event on camera. The shock he displays in the aftermath, as the secret service agents take him to have the film developed is very believable. I particularly liked the moment when the film is played and his grandchildren appear on screen in home movie footage. His apology to the impatient secret service for the delay is met with the touching response that it’s okay as this is his life and it looks like a nice one. You understand in that moment that Zapruder’s life has been altered in a way he will never be able to forget. You also understand that he is a man who is desperate to do the right thing but isn’t entirely sure what that is and his conflicted emotions as to what to do with the footage as the media offers flood in is well acted. The director explained at the screening that on the first day of the shoot they filmed Paul as Zapruder in Dealey Plaza in the actual location and that it was a very emotional experience for them all. Indeed the take in the film is apparently the first take as he let Paul do whatever came naturally in that emotional moment. The other key individual for me was Robert Oswald, brilliantly portrayed by James Badge Dale. We see the character go through the shock of hearing of his brother’s arrest, to anger at trying to understand why he has done it, to frustration at his mother’s astonishing behaviour and reaction to events. This is certainly a person I knew nothing about and his performance felt very real and believable and I felt incredibly sorry for him and indeed the burial scene of Lee Harvey Oswald is very moving due to the focus on Robert. His desperate plea to watching press to help carry the coffin from the hearse to the grave in the absence of anyone else to help was very effective. There are also some good performances from the President’s security team, who struggle to comprehend what has happened and what to do next. I particularly liked the moment when Tom Melling (of Smallville fame) refuses to allow anyone else to drive the hearse from the hospital to the waiting plane, his loyalty and attachment to the President clear. The scene that follows in which the secret service manhandles the coffin up the plane steps and through the door was quite an unpleasant and undignified moment. However it seems very realistic in its simplicity and felt true to the style of the film in highlighting moments that haven’t been given much thought before. The hospital scenes are obviously very powerful due to the nature of the subject matte and there are strong performances from Zac Efron, Colin Hanks and Marcia Gay Harden as the doctors and lead nurse trying in vain to save the President when really they know it is too late. I would have liked to have seen more of the emotional impact on them outside the small emergency room in which most of their scenes occur. Billy Bob Thornton is also good as the head of the Dallas secret service. This brings me to my main issue with the film. The performances of the ensemble cast are very good, there are some powerful moments and I liked the directorial style. However at 93 minutes long there isn’t sufficient time to give enough depth to a number of the characters included in the story. Ron Livingston for example plays James Hosty, the FBI agent who has been tracking Lee Harvey Oswald for 18 months prior to the killing and whose boss is full of anger that they did not predict what he was going to do and stop it. The FBI is very much side-lined in the film and it would have been nice to see more from Ron and this story strand, which felt very much unfinished. I agree somewhat with some views that this may have been better as a miniseries, able to delve in to the character strands far more deeply (which was indeed the initial plan by Hanks). However, overall I thought this was an interesting film, which is effective in looking at such well known events from perspectives that may otherwise never have been considered more widely, albeit not with as much depth as I would have liked. It will certainly be a film that causes people to think about the tragedy in a new light. 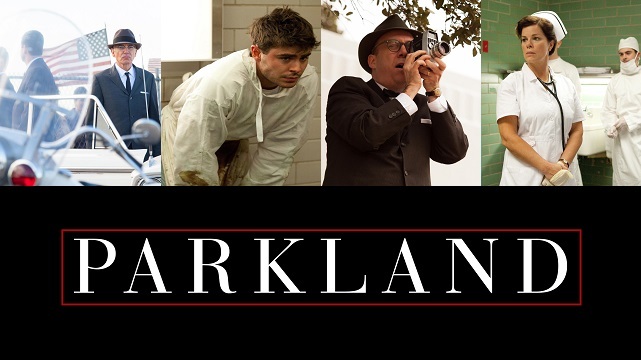 Parkland opens in UK cinemas on 22 November 2013 (moved back from 8 November) to coincide with the 50th anniversary of the assassination. It has already been released in America.